More than a dozen Stephen F. Austin State University students who are members of the Jacks Council on Family Relations student organization attend the Texas Council on Family Relations conference in Frisco. Students met with industry professionals and participated in educational sessions to learn more about their field. 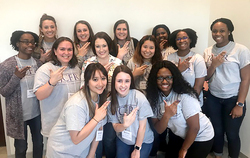 NACOGDOCHES, Texas - It was all about family during the Texas Council on Family Relations conference in Frisco where more than a dozen Stephen F. Austin State University students attended to learn about family dynamics. Several members of SFA's Jacks Council on Family Relations attended the conference where they participated in breakout sessions on a range of topics, including parent and adolescent communication about sexual and relationship violence and emotional cutoffs in nuclear families. JCFR is a student organization that builds networks and helps families within the community by learning from each other and professionals within related fields. Dr. Jennifer Newquist, assistant professor in the School of Human Sciences, said the conference's benefits were multifaceted. "The conference gave students an opportunity to learn about topics that would be useful to them in their future careers," Newquist said. "Students networked with professionals who share a passion for helping families and met likeminded students from other universities." For Amber Matthews, a distance education student from Burleson, the conference gave her the opportunity to meet JCFR members she's been working with online. "I networked with others about future education and career opportunities," Matthews said. "The conference taught me how to better understand the strengths and challenges families within the community encounter daily. This new knowledge will help me serve families in my community and in my career." Jaycie Case, JCFR president and SFA senior, said the conference highlighted the need for additional research in the human development and family studies field. "We are truly lacking research and mass involvement in topics such as family and childcare policies," Case said. "Overall, this conference gave me a look into the professional lifestyle myself and others might have in our field of study." Julie McAnally, JCFR member and Lufkin junior, agrees the conference gave her insight into the political advocacy needed for families. "There are a lot of discussions we need to have with Texas legislators about problems families in Texas face," McAnally said. "We could help each other fix these issues if we can sit down with them and help figure out what could be done." During the conference, Lindsey Lightfoot, Weatherford freshman, was elected the 2018-19 undergraduate student representative for the Texas Council on Family Relations. Her term will begin in May, and she will be responsible for attending meetings and monthly conference calls; planning student sessions for the annual conference; and serving as the liaison between the council's board, undergraduate student members and affiliated universities. "I am extremely thankful to be selected. As a freshman at SFA, this definitely reassured me that I chose the right university, one that will give me as many opportunities available to further my career," Lightfoot said. "I am excited to be able to represent SFA and to have a voice for all Texas undergraduates who are in the family relations field." The Texas council is a nonprofit, nonpartisan state affiliate of the National Council on Family Relations. This group works to promote overall heath and well-being of Texas families, according to the organization's website.